API RP 13C uses particles to measure the coarsest particle that passes through the screen, resulting in a measured value of D100. Historically API RP 13E’s D50 was considered the primary cut-point of the screen. Currently, API RP 13C uses D100 to compare two different screens. Separation curves show that the D100 value is always coarser than the D50 value. As we mention before, shale shaker screen is the wear and tear parts of shale shakers. GN Solids America LLC produce steel frame and composite frame. The frame was made with 2 or 3-layer stainless steel wire cloth. The wire cloth can be combined with the frame with metal rubber lining, or directly bonded on the frame. The main feather of the screen is every layer of wire cloth has different meshes, accurately and reasonable making screening more micromesh. wire cloth is divided into several independent small cloths to prevent excessive expansion of damage. Excellent constructed frame and high-strength injection frame enhance corrosion resistance, have good shock absorption and extend working life of screen. 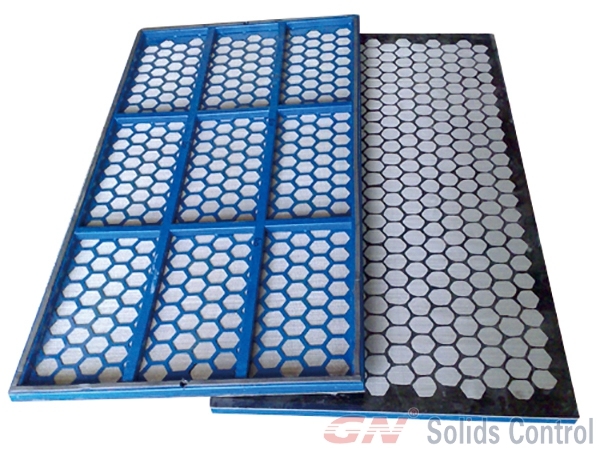 GN Solids America LLC keep consist stock of various type of screen for not only GN Solids America’s GNZJ594 shale shaker but also many popular models from various brand manufactures. « GN Decanter Centrifuge and Cuttings Dryer Stock for sale.